A four kilo hairball had been removed from the stomach of a teenager in Kyrgyztan after she was rushed to the hospital due to severe stomach pain. Ayperi Alekseeva was said to have gradually lost her appetite and refused to eat nor drink anything. This made her parents even more worried. 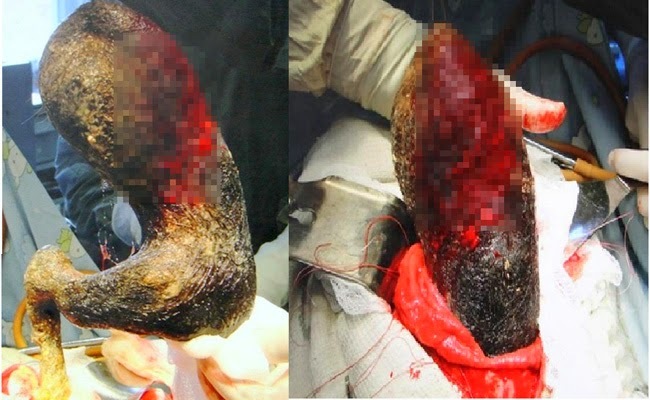 The group of surgeons which was led by Dr. Bahadir Bebezov had removed the hairball. According to Dr. Bahadir Bebezov, the hairball had been detected through x-ray. Unfortunately the extent of its size made it impossible to be removed by any other means except through surgery. Dr. Bahadir Bebezov said that the was no other way as Alekseeva’s stomach had been badly swollen with hair and carpet wool. After the stomach was cut, the hairball just seemed to have oozed out of the organ. Ayperi Alekseeva was 18 years old and she had to be transported to a different hospital in Bishkek City for further treatment. The cause of the hairball had been Alekseeva’s habit of eating the end of her follicle and even picking up the hair from the carpet and eating those too. The case of eating hair, usually one’s own hair, is called trichophagia. Tricha means hair while phagein means to eat. It usually starts with a disorder called trichotillomania, an uncontrollable impulse to pull ones hair.